Is spirit filled and ideal for use indoors, be it an office, shop, warehouse, factory or your home. With an extra large 20cm height, this wall mounted thermometer has a modern look which is easy to read and ideal for quickly monitoring the current temperature. With a clear temperature display in both °C and °F and the ability to accurately measure a temperature range from -30ºC to 50ºC, this is one of the most popular Factory Act shop thermometers available. 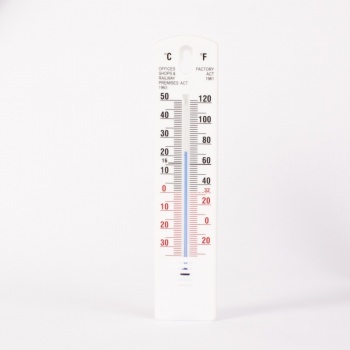 The Factory Act Spirit Filled Thermometer is ideal for monitoring the temperature of environments across industries whether that is in an office, shop, warehouse or even factory this simple spirit filled thermometer can do just that. Complies with Shop and Factory Act Regulations. I needed a thermometer to check that my central heating thermostat was working OK. These were very cheap and do the job very well. Easy to order and fast delivery. Very pleased.